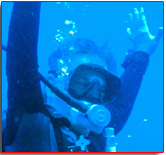 Hi ; I’m Lee and I have been diving since 2001 and I’ve had a passion for diving since my first open water dive in Catalina. There are no words to describe the beauty and tranquility of the underwater world. I would love to share that with you. My goal and that of GR8 DIVN is to help you become a safe, comfortable, confidentandwell educated diver. Starting with yourfirstopenwater class and then onto Specialty Diver – Advanced Diver – Master Diver you are the one to set your goals and limits.